Students who have graduated from Elizabethtown College or left for other reasons lose access to their college email account. If you still need to access old messages, ITS can send you a PST data file, usually on a CD. Below are instructions on how to access those messages through the PST data file. 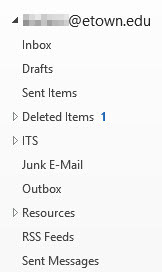 You must use Outlook, not OWA. Step 1:Insert the CD into the computer’s CD drive.Step 2:Copy yourusername.pst to your desktop. This is important as you can’t open the file from the CD in Outlook. Step 3:In Outlook, click File.Step 4:Select Open & Export.Step 5:Choose Open Outlook Data File.Step 6:Navigate to the Desktop.Step 7:Select yourusername.pst.Step 8:Click OK.Step 9:A folder named yourusername will appear in Outlook’s folder list. If items are not showing in the folder, wait a few minutes. It may take a while for items to appear. Step 10:Select Inbox and read your messages.If you kept any calendar appointments, contacts or task they are readable also.